Writers, musicians, artists, hairdressers – in short, anyone who puts their hands, wrists and arms through the same repetitive motions to perform specific tasks are at risk of developing carpal tunnel syndrome. While it’s currently the leading occupational illness in America and the most common cause of physical disability in the world, there’s a general misconception that if you simply wiggle your fingers, shake your hands, get a shoulder massage, or change your position, it will go away by itself. Not so. 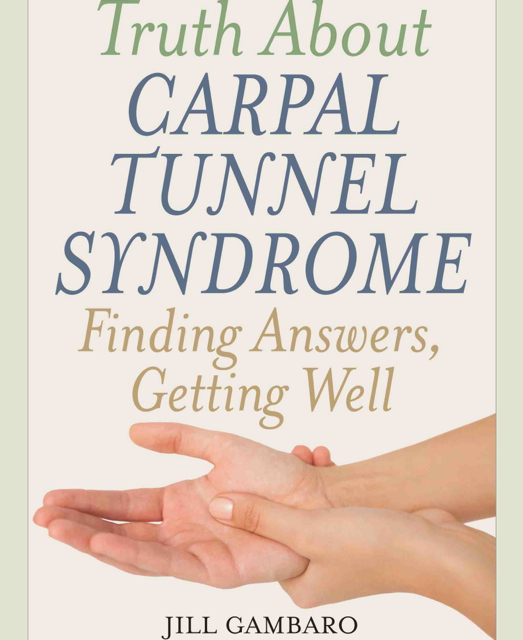 Author, speaker and accomplished screenwriter Jill Gambaro not only knows from personal experience that carpal tunnel symptoms should not be ignored but has also written a book that sheds light on how to keep them from impacting your quality of life. Q: Let’s start with your diverse background as a writer – a dream job that calls for long hours sitting at a desk with fingers poised over a keyboard and eyes riveted on a computer monitor. At what point in your professional career did chronic pain rear its ugly head and cause you to seek a remedy? A: It was during a day job actually. I was working as a temp, mostly in law offices, which was really a production typing job at the time. Typing 125 words a minute, seven hours a day is what caused my injury. Q: I’m assuming that this was at a time when a lot less was known about the origins of this type of ailment? A: Oh yes, water cooler wisdom at the time was that surgery with a three week recovery would fix the problem. It was only once I began receiving medical treatment that I discovered that was rarely the case. Q: What sort of treatment regimen was used and how effective was it? A: Physical therapy and bracing was and still is the recommended treatment. What they don’t tell you is that not all physical therapists understand how to treat these very complex injuries. What they call work hardening—strengthening muscles through weight lifting—is a rehabilitation philosophy that only aggravates repetitive strain injuries. Bracing also is controversial because lack of movement is just as bad as incorrect movement. Q: Was any of this covered by insurance or was that, too, as yet uncharted medical territory? A: Even though I was a temporary employee, legally, it was determined I was covered by workers’ compensation insurance. But that also meant I was the subject of a lawsuit on top of everything else. For the many who aren’t covered by insurance for such an injury, it can be both a blessing and a curse. A blessing that you can get treatment; a curse that insurance often doesn’t pay for treatments that are effective. Q: From both a physical and psychological standpoint, how did your injury and the aftermath affect your ability to write? A: Psychologically, I have to write, there’s just no two ways about that. And, at a time when I was in the throes of so much emotional pressure, writing was really my best escape valve. Unfortunately, not being able to physically type or hold a pen, made that very challenging. I had a lot of success using voice recognition software and wound up finding a whole new freedom as a writer through its use. Q: Were there any support groups available as a resource or did you sally forth and create your own? A: Very soon after I became disabled I found the Los Angeles Repetitive Strain Injury Support Group. They were a godsend. Their monthly meetings with medical professionals provided hour-long lectures on clinical practice, theories and treatments. It was such a tremendous help I wound up on the board of directors. There are like groups all over the world, some meet physically, others offer a Q&A format on the web. The RSI community is very open about sharing. Through my blog, I try to pass on the information that comes out of these groups as much as I can. Q: Unlike other injuries where there is some sort of visual evidence of pain, carpal tunnel hinges in large part on the afflicted person’s verbal description of what’s going on. In my own experience, I can recall no shortage of office incidents where an employee citing extreme discomfort was perceived to be whining just to get out of work. For someone who is genuinely hurting, how do these perceptions exacerbate the problem? A: That’s a very good question. It is so hard to be in overwhelming pain, while those around you say you’re making it all up. It was only when a doctor gave me a diagram of the front and back body and a set of colored pencils, so that I could color my pain that I was able to effectively communicate what I was experiencing. That diagram is affectionately called pain man, and tools like that can really help. Q: What inspired you to write this particular book? A: The first half of the book is a layman’s explanation of the biological mechanisms that make repetitive strain injuries so difficult to treat. It’s meant as a guide to help people recover. But it’s really the second half of the book that I’m most passionate about. It describes RSIs from a larger, economic impact. The bottom line is, good information can help everyone—employers, workers, even insurance companies—save a lot of pain and money. Q: Given the severity of your injuries, how did you approach the physical challenge of writing it? A: While voice recognition software helped a lot, typing isn’t the only task in writing a book. I had to be very disciplined about pacing myself, so I drew up a schedule that wasn’t impossible to stick to. It included a lot of breaks and made room for all the differing tasks of writing a book: research, drafting, editing. I also made time to walk every day; walking helps keep the pain away from me. Q: Along with sharing your own experience as well as your extensive research on the topic of carpal tunnel injuries, you’ve also become an outspoken advocate in the political arena to increase awareness. Tell us about it. A: I like to say that I fought city hall and failed miserably. In the early 2000s, Arnold Schwarzenegger had just become the governor of California with reforming the workers’ compensation system as his first task. We at the Los Angeles Repetitive Strain Injury Support Group leapt at the opportunity to shape public policy, and while many listened to what we had to say with great interest, in the end, the big money won and the system became even worse. Once, I even flew up to Sacramento to speak at a press conference. My back hurt so badly, I had to kneel behind a table to speak. I had to stop several times to remember what I wanted to say. The whole thing was caught on tape by news outlets and, as a seasoned media professional, I was mortified. Then I received calls from other injured workers, thanking me for speaking out. It made me remember why I was doing it. Q: What did your injuries teach you about yourself as both an individual and as a member/leader of a creative community of fellow wordsmiths? A: The injury did teach me a lot. My healthcare practitioners kept telling me throughout, “you’ll get through this better than most”. I hung on their every word, believing it was my tenacity they saw. In retrospect, it was the powerful sense of mission that got me through. Writers, I believe, are society’s therapists. It’s up to us, whether journalists, humorists or screenwriters, to analyze, critique and give feedback to the world at large. Q: How is writing nonfiction different from writing screenplays? A: Well, it’s very different, and not different at all. Screenplays are first and foremost about structure, but then you layer character and mood on top. You’re also telling a story, through pictures, using words. Non-fiction is supposed to be more straightforward than that, but I found in writing the book, that’s not entirely true. I struggled with some of my conclusions in the last few chapters of the book just as much as I would struggle to tie up a plot in a script. Q: Tell us about your path to getting this title published. A: It took 12 years to get the book published. Initially, I found a lot of interest among agents in the title, but they couldn’t place it with any publisher. Then, serendipitously after sitting on the shelf for several years, I met a fellow writer who thought her own publisher might be interested. They weren’t but they encouraged me to find a smaller house. I credit my experience as a producer, looking at the project as a business venture, for my success. I only queried two other publishers, both of whom asked for the manuscript off a cold query. The second one offered me a publishing deal within 30 days. Q: Was self-publishing ever an option for you? A: I seriously considered self-publishing but knew there were other patients who had written about their experiences, and never reached the audience. In the end, I thought Rowman & Littlefield’s academic reputation would lend a credence that self-publishing would not. Financial considerations got sacrificed in the process, but I’m hoping to make that up down the road through foreign sales. A: I’m a wimpy patient. I like the kind of doctors who are warm and have a caring touch. I was the squeaky wheel who got the grease, but often through tears. A: I’m so inspired when others achieve that special spark in their work. It doesn’t matter if they’re writers or doctors or auto mechanics. When someone is passionate about what they do and pushes himself or herself to reach their best potential it makes me want to push myself. A: I’m bringing my visual storytelling skills to bear on the prevention of carpal tunnel syndrome. Musicians get it at an alarming rate but largely have to hide their pain. A little awareness would go a long way so I’m looking for brand partners to launch an advertising campaign. Q: Where can our readers learn more about you? A: Set a Google alert! You can follow me on truthaboutcarpaltunnelsyndrome.blogspot.com and LinkedIn, where I blog regularly. On Facebook.com/truthaboutcarpaltunnelsyndrome and @JillGambaro.